A rollover accident, in which a car tips over onto its side or roof, is a dangerous vehicle crash. Rollover accidents have a higher fatality rate than other car accidents. 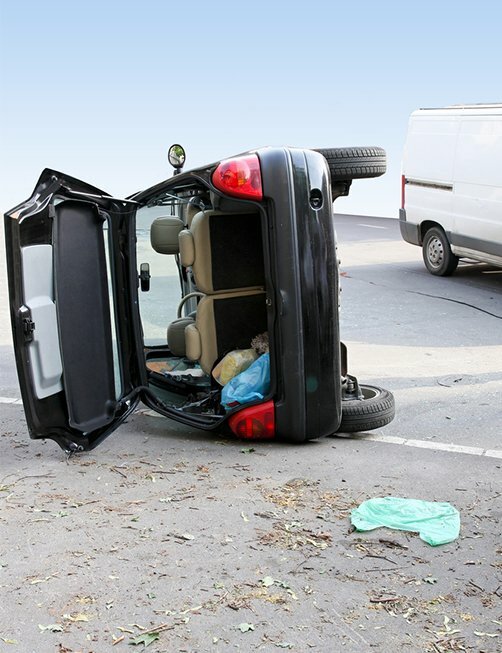 If you or a loved one has survived a rollover, your injuries are likely to be serious, but you may be lucky to be alive and should immediately contact an experienced car accident lawyer in Baton Rouge. As you may expect, the increased speeds allowed on Louisiana interstates and highways result in more destructive crashes when car accidents occur. When high-speed rollover accidents occur in heavy traffic, multiple vehicles may become involved, resulting in pileups that damage many cars and injure or kill multiple people. Our Baton Rouge rollover accident lawyers are confident that we can make a difference for you. In fact, having an experienced accident lawyer on your side after a car wreck may be the number one factor in your obtaining any recovery at all. That said, if you don’t obtain a financial recovery, you will pay no attorney’s fee or costs. Babcock Trial Lawyers works with rollover accident victims in Baton Rouge and throughout Louisiana to help them obtain insurance compensation for their injuries and other losses. If another driver or a third party is responsible for your rollover crash and resulting injuries or wrongful death, you should be compensated. The auto accident attorneys at our law firm aggressively pursue rollover accident cases to obtain payment for clients’ medical bills and expenses, lost income, pain, suffering and more. Car accident victims represented by Baton Rouge personal injury lawyers Stephen Babcock and Chase Tettleton command respect from insurance companies. Babcock and Tettleton are known for aggressive negotiations, meticulous casework, and strong courtroom presentations. Individuals and families dealing with the aftermath of a serious car, SUV, or truck accidents like rollovers turn to Babcock Trial Lawyers with confidence. Babcock Trial Lawyers offers a free case evaluation. We’ll outline your legal options and our 100% Satisfaction Guarantee: No fee until we recover a monetary award for you and, if you are not 100% satisfied, terminate us within 30 days and you won’t owe us anything at all. Nothing. No costs. No fees. No kidding. How Did Your Rollover Accident Occur? A rollover accident is a violent and serious crash. It takes a lot of force to topple a motor vehicle that weighs two tons or more. Any vehicle can roll over in a crash, but taller, narrower vehicles such as SUVs, pickups, and vans are more likely to roll over. Their higher centers of gravity make them more vulnerable. Driver error is the cause of most car accidents, including rollovers. If your rollover occurred as result of a collision — another driver running into you — it is almost certain that the other driver was moving at an excessive speed (i.e., speeding). Such recklessness is often connected to other forms of negligent driving, including aggressive driving, drunk driving, distracted driving and fatigued driving. Each can lead to speeding and/or lack of braking to avoid a collision at full speed. Most rollover accidents are described as “tripped,” which means some object serves to push or guide the vehicle over onto its side or roof. This could be a curb, guardrail, or soft or uneven ground on the shoulder of the road. One or more of the vehicle’s tires are stopped abruptly, and the car’s momentum causes it to roll. In other accidents, a bump or dip makes the vehicle hop and a portion of its front rides up a guardrail or guy wire in a ramp-like fashion, causing the vehicle to become airborne and roll over. The tripping mechanism likely exists because of defects in the roadway or associated structures, which may be due to lack of maintenance or a design flaw. A taller vehicle is more likely to roll over in an accident because its center of gravity is so high. A rollover can even be caused by taking a curve too fast, swerving quickly to avoid a collision or by trying to negotiate a steep slope. In commercial trucks, rollovers are often caused by cargo shifts pushing the vehicle off balance. This can happen in overloaded passenger vehicles, as well, particularly with luggage or gear loaded onto the roof. However, rollovers are also caused by vehicle failures. A blowout of a tire, for example, can trip a vehicle and cause a rollover. If brakes fail before a sharp curve, the vehicle’s speed may cause it to roll over. An airbag suddenly inflating for no reason might cause the driver to reflexively brake and turn sharply, which could trip the vehicle. Consumer Reports suggests that “sporty” aftermarket SUV and pickup truck tires can provide more lateral grip than original-equipment tires, which increases the chance of tires gripping and tripping the vehicle in a sudden maneuver and causing a rollover. You may already understand the primary cause of the rollover accident you were involved in. But there may be a secondary cause and a third party involved, which may make it possible for you to obtain compensation from multiple contributors to your crash. In most rollover accidents, an investigation of the accident is warranted. If vehicle failure contributed to a rollover, the vehicle or automotive parts manufacturer may be liable for the accident. Particularly in older vehicles, injuries in rollovers are made worse by roof collapse or roof crush caused by the vehicle’s inadequate roof strength. If a road’s soft shoulder, which should have been built-out with a hard surface, caused a rollover, perhaps the local government or a contractor should be held responsible for faulty design, which contributed to your accident. In an accident involving a transfer van, such as a 15-passenger van operated by caterers to ferry attendees at a corporate event, the private company responsible for the driver and van might be held liable. Perhaps the company should not have hired the inexperienced driver who rolled the van by taking a curve too fast. 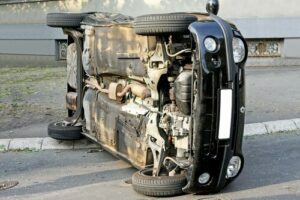 Even when it’s obvious that a reckless driver caused your rollover accident, the work of an aggressive car accident attorney from Babcock Trial Lawyers can provide the legal knowledge and investigative work necessary to obtain the most compensation available from your accident claim. There may be multiple parties responsible for a rollover accident. Attorneys at Babcock Trial Lawyers recognize this potential and work to identify all liable parties and insurance coverage applicable to your case. In the end, maximizing a settlement for you means targeting every available source legally and financially obligated to you because of their role in the accident. As your legal advocates, Babcock Trial Lawyers will negotiate aggressively with all parties responsible for your rollover accident. We have the resources and investigative know-how to make a solid case, and the dedication to press your claim before insurers of any size or before judge and jury when that’s what’s required.